Are you looking for a photo editing service or not satisfied with the current one? Then you cannot choose the perfect photo editing service for your own. Selecting a best photo editing service is very easy. It depends on what type of photo editing service you are looking. If you are looking for the service that, edit the product’s photo, then you should choose those editing services who work with the products. If you are an event manager, then you should select those services which work for this industry. Or if you are a filmmaker or a professional photographer of the model you should choose Portrait image editing service. 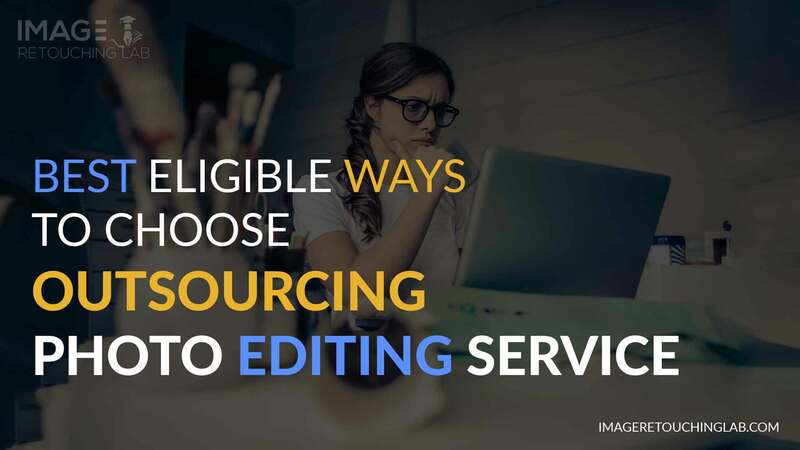 There are many types of editing service, and they are entirely different from another. For example, you need winter cloth, but your wife bought a t-shirt for you, and then you will suffer in the cold. So the photo editing service also looks like that. You need portrait image editing service but you select the Image editorial correction service then you are just wasting your time and money. After reading content, I am sure you can choose your best photo editing service. 1 Let’s See How We Choose The Best Outsourcing Photo Editing Service! Let’s See How We Choose The Best Outsourcing Photo Editing Service! All the photos are not the same, so the editing of those will be entirely different from one another. For example, some of the e-commerce industry uses white background photo editing service. So some company provides the facility to remove background white. Whereas, other companies offer full photo editing service including the vector Convention and clipping path. If you don’t get the perfect you want, then you should ask an expert to choose. Always try to be clear about the looks you want in your photo. Here are some types of editing. This type of editing needs in the fashion industry. Though there are many apps and applications to do or make a portrait image editing. But those applications don’t give you the perfect image editing service for your image. As the fashion industry is growing, so the demand of the portrait image editing is also increasing higher. For the better look on a model, it’s essential to edit his/her photo nicely. This type of image editing service mostly used in the newspaper or media. Where the company needs a clear vision of a man or things. The demand for this type is always on the market as the growing amount of online news media. And some big or small media have outsourced their editorial images for the best quality. In this type of photo editing, the expert use graphics and edit photo with his creative mind. In this way, you can make a simple image into the best one. And that’s why it has too much market demand, and it really needs too much effort, and it is costly as well. Need a beautiful photo? Or you are trying to enhance the light of your picture? Then you must try this type. In this type, the sector or industry is not limited. Here the fashion industry needs this type of photo editing expert. It also requires much effort. In this image beauty editing service, the expert needs too many filters to make the picture beautiful. This editing service also connects with product background editing. Here the expert edits the edge part of the photo. The e-commerce industry uses it to remove the background of the picture. The types of demand are too much, as the e-commerce site and the personal e-commerce business is growing day by day. It is similar to the Clipping path. In this type, the expert work is to make the product look good. And for that some time they remove the background and enhance the light and tune the image. The big industry like Amazon eBay and other use this. As they are also the high profiled e-commerce site. This service is very demandable in this current time. There are lots of different editing service as well. Not all of them are very hard to do, but approximately all of them are very useful. That outsourcing photo editing service helps a lot. If you are done to select your edit type, then visit those sites that can fulfill your need. But before that, you need to analyze the location of the company very thoroughly. See the site carefully in the service section and check, do they have any experience on the same project or not? Sometimes some companies provide some limited or specific service. On the other hand, some company who provide all the facility for photo editing. For example, A is the company who offer only the background removal service; on the contrary, B is another company who provide background removal service along with the color correction service. Now it is up to you to think which one will be better? Everyone will say B is perfect because they will provide extra services as well. So always be careful and try analyzing the site. It’s a significant thing that you must have to read before you started to use that service. If you select a specific type, then you should read the terms and condition about the section that you have select. Check them are they precise with your wants or not. If your mind arises a question, then ask it on the FAQ. Always try to be clear from your side. If the terms are user-friendly, then you can move to the next point. Good times always results good for both the client and the company. If you are clear with the term and condition of the site now move to the customer review. What the customer says about the place. Did they fulfill other customers’ needs or not? Sometime there may be some fake review that they show to attract the customer. So find that is it real (natural) or not. Always be sure that a review shows the short form of the service quality. Read all of those reviews on which you are going to give the company to edit some photo. If the reports are right, then forward to the next part. In the client support section, you will find some hidden issue about the company service. Customer support always gives a customer a favorable view of their service. It shows how much serious are they about their customer. You will notice it when you send them a message or call them, and how faster they reply. Those company who respond faster, they care about you and your project. They will know that every customer is profitable. But if not then they don’t care much about you and your project. So don’t waste your time for their reply move forward. There are many ways of editing. But all the idea is not the perfect way to do an ideal work. If they don’t work correctly, then you will not get the ideal view that you want. So, all the time and your hard work will go in vain. So if a company work properly, it may take some extra take time, but eventually, the work will be helpful. But if they work rashly even in the right way, they may deliver your work soon, but you won’t get the perfectness in those. For example, here are two way to remove the background. One is using Pan Tool another is using the magic tool. Somebody may say it is different between that two tools, but if we look with more attention than we will see that the edge of the picture is not perfect, which we make via Magic Tool. But the same thing on the Pan Tool you will get the ideal edge shaping. Sometimes they use an old tool to edit a photo which hurts the picture. So before you hire, you must have known the method of photo editing. The most critical point of a Company’s capacity is that how many photo expert the company have which you will choose. If there are only a few numbers of experts, then you must not hire them. As there is a lack of experts, they may deliver their work late. As a professional, you don’t want your work to be late, no matter you have an E-commerce site, like Amazon, eBay, etc. or whatever. I hope you don’t want your product photo to publish lately. So to get the idea about the office of that company make a video call on Skype and see around the office how many people work there. Is it capable of doing the work that has been ordered by you for your company? Or you can give them some task and see can they complete you work in time. If they can that’s good you can carry on a relationship with the company. It’s an important and valuable factor for all the company or the individual also. Delays in delivering a product mean a significant loss of a business organization. So all work must be done in time. And talking about the outsourcing photo editing service, it’s also the same. Before making a relationship with a company, you must create an agreement between the company and the client if they cannot delivery client’s work they will not pay for the photo they edit. It would be better to choose those service providers who provide service 24/7. So that you can get help when you want otherwise you will be in a significant loss. Data is the most valuable thing for both a company and a person. So the protection of the data must have some secured place. Some company tries to keep secret, and that’s why they prefer ISO 9001 certified service provider to work on their project. So every service provider doesn’t want to keep data of their customer unsafe. So you must have chosen those companies who give you that type of facility. It’s an option where you can edit some of your photos for free of cost. They don’t charge for the picture that you have written. It has a benefit that you can see their work and then you or your company will give him a project. In this free trial here is also a loss for the customer. Here are some small companies who try to attract customer rather than provide excellent service for the existed customer. So they try to make those trial photos look good or as you want. If you are looking for an Outsourcing Photo Editor Service Company, firstly you will think about the price. It’s all upon on your needs and your budget. If you believe that if pursuing the service of background removing is enough eligible, then go for it. If that service is within your budget, then you will pay for it. If you pursue additional element like vector scrap etc. so you must pay for the extra some money to continue it. Before making a relationship with the service provider, you must have known about the hidden charge of the service. So when you saw and searched the photo editor company’s site you can compare with one another. Like here A is a company who provide service. They remove the background of the photo. For one picture they demanded 0.30$. On the other hand, B is another company who also assist. They remove photo background and color correction service. Per photo, they demand 0.50$. So if you compare those two things, I will suggest you choose the B. Though they are making money, they edit the photo as you want. Which one you will pick it is on you. Sometimes many sites give offers for their promotional purpose. So visit the website, compare their service and compare their cost, find out your idle online photo editing service. If you are finished with the content now go, and starting searching for the best company of outsourcing photo editing service. In short, choose your topic first, analyze company site, read the condition of the site, search for a review, learn more about the client satisfaction, know more about the delivery date, know widely about your data security, and compare the cost. Go through those tips or tricks, and I am sure that you will get your best photo editing service for your company or as you want. Thank You. Sure you can read our other blog too.